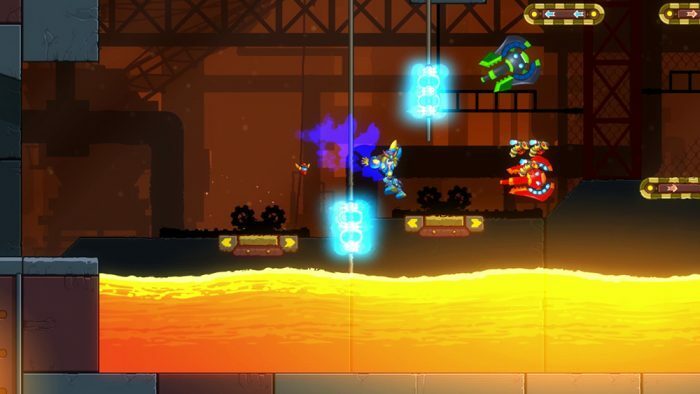 Batterystaple Games’ 20XX feels very familiar, on purpose. 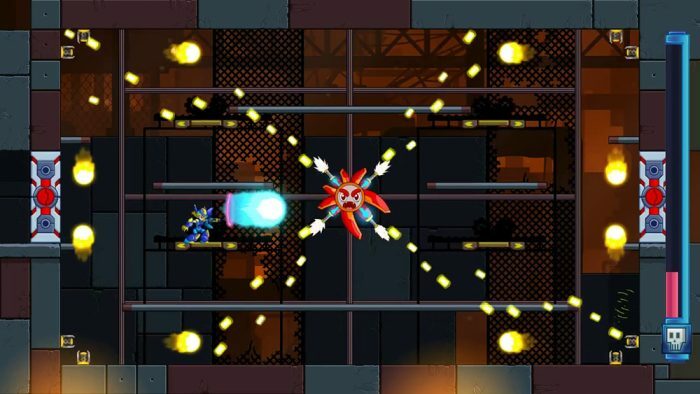 Designed by fans of Mega Man X, the game focuses on capturing the classic’s essence without over embellishing its homage or straying too far from the formula. It’s fan fiction, by fans who really know the content but also know their legal limits. That lets a game like 20XX spark nostalgia on one hand, but also feel fresh at the same time. So, with robot action platforming sentiment in full swing in 2018, 20XX is out of Early Access and finally in our Switch loving hands, ready to fill a void that’s been opened for far too long. The moment I fire up 20XX, several things become instantly apparent. The game plays exactly like how we’d expect: our robotic character runs, jumps, shoots and dashes around levels, avoids obstacles, survives falls, and takes on robot bosses. There are weapons and skills that can be obtained and unlocked, paper-rock-scissors strengths and weaknesses, and even a title screen that mimics a certain rooftop scene. But all of that is easy to ape. Where the game really focuses its efforts is in how it uses these as inspiration rather than directly copying. There’s no real story in 20XX. Sure, there’s a “save the world” plot, but it’s very light. Instead, the game asks us to go through runs of its levels and bosses, trying to improve our score and grab more loot. This in turn can be used for unlocking upgrades and weapons. The game itself is a simplified rogue-like, meaning that it jumbles chunks of levels out of its pool in succession rather than completely unique creations each time. The chunks feel a little repetitive, especially after the third or fourth run, but they’re also well crafted, so though it doesn’t always feel like a new run, it at least feels like it all belongs together. We can memorize the layout of those chunks to help us along, sure, but it also isn’t unique enough to surprise us each time we play. There are only four level themes, but with eight bosses there are plenty of dangers to be mindful of and keep us on our guard. The variety of weapons and upgrades is a nice way to motivate us, to be honest. With the ramp up of difficulty across those worlds, the continual improvement our characters is a necessity. In fact, the variety of weapons and upgrades is nice, and I took a liking to some of the larger, more explosive projectiles. The two selectable characters provide a slight bit of variety as well; Nina, who’s blaster functions like Mega Man’s arm cannon, and Ace, who wields a sword and more resembles Zero. Though they carry some of the feel of classic games, the visual style isn’t as striking, coming off flat, like a Flash animation from a few years ago. Both can be on the screen at the same time when players choose to go co-op, with the screen zooming in and out. I’ll note, though, that playing while on the small screen in co-op can be a bit of an issue as characters get very, very small, especially when we need to rely on some pixel-perfect platforming. Even though it’s baked in classic feels, there’s a freshness to 20XX. I like that it’s not necessarily trying to get us to complete a story, but to compete against others (or ourselves) for better scoring runs. The daily and weekly challenges keep me coming back, and hopefully will for a while as more people jump into the experience, and it’s nice to play in portable mode for a half hour or so on the deck while letting my mind wander. Batterystaple and Fire Hose Games wear 20XX’s influences on their sleeves, but then pack a fun and often contemporary little game underneath. The review is based on a retail eShop code sent to SideQuesting by the publisher.